But they also remind me of fabric circles, like my mom and grandmother used to make before they sewed them together to make those wonderful quilts! The color scheme of this artwork with its rainbow of colors, both muted and bright, works very well and the whole piece comes together in a wonderful harmony. 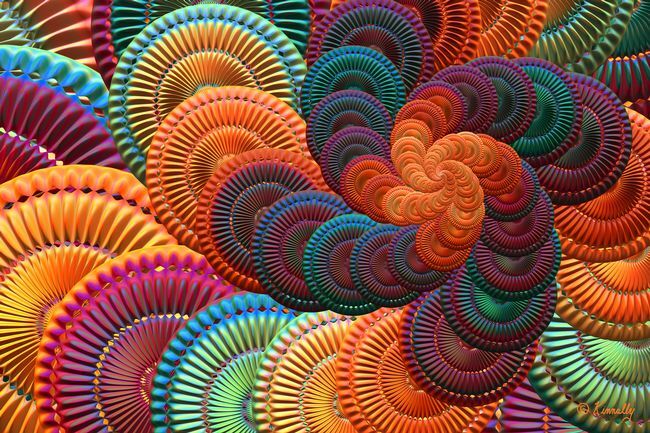 The 3D effect of each ‘coaster’ and the layering of one on top of the other in a beautiful spiral pattern gives a dramatic look to the art and adds lots of visual interest. Some comments at my Online Gallery are: Absolutely fabulous! All the Best. – This is my favorite! Very cheerful, lots of motion! – Wow your work is amazing. I love fractals and you have mastered the technique 🙂 – Fantastic work! – lovely ! nice colours – Very cool – Captivating and mezmerizing image! – Amazing. Needless to say this sort of reaction to my work pleases me very much! I hope you enjoy the artwork as much as they did!